Let us take a moment to throw back our heads and cackle with full-throated, schadenfreude-infused mirth: Abercrombie & Fitch, that floundering mess of a company whose corporate strategy can best be summed up as "Extremely thin hotties only (no fat people allowed)," is now introducing larger sizes for women because they're all out of other customers. This is exactly like the comeuppance section of a heartwarming teen movie (only, we will not all join hands in acceptance and understanding because A&F is going to go bankrupt). A&F's shares have lost 30 percent of their value this year (daaaaaamn), but it's not just a matter of "it's no longer 2003" — rival tween paradise American Eagle, for instance, did far better than projected by Wall Street this past year. I was in American Eagle just last week (buying a Luke from the O.C. Halloween costume for my boyfriend, duh) and I can affirm that it looks like 2003 exploded all over that place. 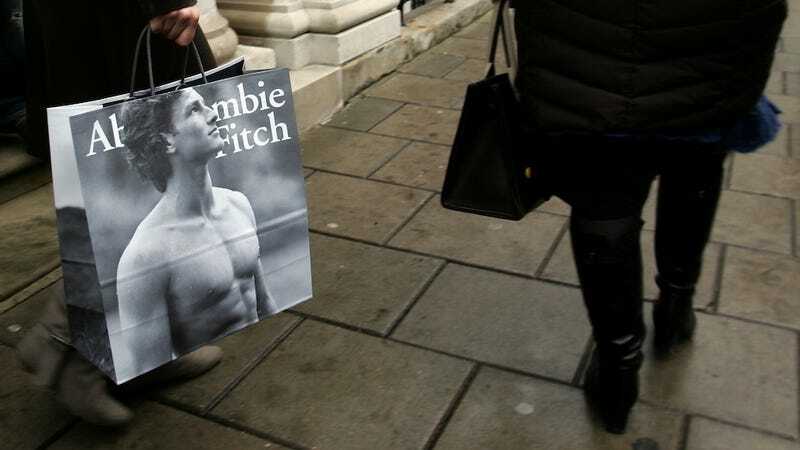 So while there's still a market for Abercrombie-esque goods, no one's really interested. The company hopes to amend this by introducing more products: they're planning to sell shoes and accessories and, most shockingly, sizes above large. But will anyone buy it? The company has become fairly notorious for being fat-phobic and generally gross. It's painfully obvious that the introduction of larger sizes was so clearly done in a desperate bid to amass more consumers, not to ameliorate the CEO's dumbass assertion that he doesn't want fat people shopping in his store because Abercrombie is for "the cool [thin] kids." At this point, I find it hard to believe that introducing more size diversity will make much of a difference. In closing, this is far too little, far too late. Bye, Abercrombie — don't let an A&F spokesmodel spritz you with a hellish cologne sample on the way out!